Precision, Performance and POWER is the goal of TK hockey with their S2 hockey stick. One of the best sticks I have written a review on for a while, the Synergy S2 hockey stick from TK is powerful above anything else. Every piece of scientific technology used in the TK Synergy S2 is designed to make a hockey stick that is super stiff giving huge amounts of power when hitting the ball. To create a stiff, powerful stick most manufacturers load it with carbon. At 70% carbon the TK S2 is not in the top bracket for it’s carbon in its material composition, though TK make it’s carbon with technology all designed to exploit carbon to it’s fullest potential. What does that mean? Well you can find plenty of information online about TK technologies, so I am not going to re-write that. I am going to review how much science is given to the Synergy 2, just with the purpose of making the carbon perform powerfully. Carbon Straight Bar Reinforcement (CSBR), Nano Technology and Sheepfoot Compression Molding (SCM) are all processes in the manufacturing of the TK Synergy 2 designed to stiffen and add power to the stick. These are a range of processes that straighten, align and bond the materials in this stick together with the absolute goal of making it hit the ball hard. My game is not so powerful as standard, considering the price and position of the TK Synergy S2 what stood out to me when using it for this review was how my slap passes increased in power. Anyone can take a full swing with a hockey stick and knock the ball right across the pitch. What we all want to get to however is having the ability to quickly slap the ball up-field or cross-field to a team mate before the opposition mange to cut out the pass. In my opinion because of the power you can transmit to the ball with the Synergy S2 this is easier to achieve. Another thing that makes this quick slap hit possible with the TK Synergy S2 is it’s weight. This stick feels light and therefore you can swing it quickly. The 36.5” model I used was weighing in at 548g, which is on the light side of the spectrum, almost pushing some other brands super light version. Despite this lightness the best thing to review is that the TK Synergy S2 is it continues to strike the ball hard. Personally I’m not a fan of the face on the head of TK hockey sticks. I have not found one yet which hugs the ball in the way I like. 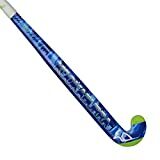 The Synergy S2 is no different, if you rely on the stick rather than your skills to keep the ball under control you may be better off with a stick that has some assistance in this area. My friend has a Synergy 1 and complained about this at the beginning. To be fair he is not really a massive close play dribbler of the ball so it has not effected him much. Another area TK are great at and the Synergy S2 has is it’s low bow. The curve on it is the maximum allowed at 25mm and low in the stick at 225mm up. However it feels even more extreme than it sounds because of the way it takes what seems to be a dramatic turn at the bow point. Amazing for scooping up the ball in many circumstances, not least when you are looking for that powerful drag-flick effect from short corners. I also welcome the addition of the Carbide Diffusion Technology (CDT – they couldn’t make up any more buzz phrases these guys), which is added to the head to stop it getting beaten up by the astro. On the less expensive ranges from TK you quite often see sticks a year or two old looking pretty scruffy on the heel. This should stop that, or prevent it for longer. Let’s make no mistake, the TK Synergy S2 is a fantastic low bow stick for a striker or attacking midfielder. Powerful through and through, brimming with technology and light enough to swing around quickly. Another stick in my opinion that offers really top end function for quite a reasonable price, in comparison to those absolute top end carbon sticks. There seems to be some confusion at some retailers, for clarity the TK Synergy S2 is not available in a “Deluxe” version, if you buy and S2 you will get an S2 (other TK Synergy’s are available in a couple of models. This 2014/15 version of the Synergy S2 is only available in Black with Silver logo, get that colour and you can’t be wrong.